Investing > Investment Strategies > Fixed Income > What Happens To Bonds When Interest Rates Rise? Bonds fall when interest rates rise because of the inverse relationship between rates and yields. That relationship is one that’s difficult for most investors to understand, and one they haven’t had much experience with in recent years amid consistently low rates. But the impact of rising rates on bond yields is important to understand – and be ready for it – because sooner or later, interest rates will in fact go up. What, you are asking yourself, bonds can actually fall in price if yields rise? This seems wrong as higher interest rates should create more income on a bond investment. After the last 30 years of declining interest rates, most people are now used to bond prices increasing. They are not prepared to see some pretty large drops in outstanding bond prices with sustained increases in bond yields. The danger to bond prices is much higher than at any time in recent memory with the extremely low yields in the bond market, which make bonds more sensitive to changes in yields. This is quite dangerous, as most bond traders and investors have little experience with rising interest rates. The last period of sustained increases in interest rates was from 2003 to 2008 when the U.S. Federal Reserve tightened monetary policy. Many current bond traders and bond portfolio managers have only known conditions of loose monetary policy and falling yields in the years since the 2008 credit crisis. Few remember the bond market routs of the late 1970s or the sell offs in 1994 and 1998. Given the lack of investor experience with rising yields, here is a primer on the inverse relationship between prices and yields. So why do bond prices change with changes in prevailing interest rates? This is easy to understand if you think about the relationship between outstanding bond coupon payments and the coupons of new bonds issued at current interest rates. It’s important to remember that most bonds are “fixed income investments” and have a fixed coupon that is payable until maturity. For example, the current “benchmark” Government of Canada 10 year bond is the 2.25% which matures on June 1st, 2025. This bond was issued June 19th, 2014 and anyone who bought it on issue gave the Government of Canada $98.85 in exchange for $2.25 per year in interest (actually $1.125 semi-annually) until the principal of $100 is repaid at maturity. Most bonds are not issued exactly at $100 since issuers choose a coupon that is a round number and this bond was issued at a bit of a discount to achieve the 2.25% coupon. The current market price of this bond depends on the prevailing yields in the bond market. When this bond was issued, the prevailing 10-year bond yield was a bit over 2.25% so this bond was issued at $98.85, the amount the investor gave to the government at the time. We have graphed below the price of this bond since it was issued to the time of writing in early June 2015. Note that it actually started to trade at $99 and fell to a low of $98 as bond yields rose after its issue. Yields then fell in the bond market and the price then rose to above $101 before falling back to $99 in mid September 2014. Now look at the strong run up in price to a peak of nearly $110 in early February 2015, an increase of $11 or 11% as bond yields fell to generational lows on deflation worries. People who held this bond were likely pretty happy with their price appreciation. Now they could be questioning their investment, as the price has dropped back to $104, a decrease of 5% from the peak price of $110 due to rising bond market yields. Now that you have seen the evidence that bond prices do indeed change inversely with bond market yields, let’s think about why this is. Let’s say you had bought this 2.25% bond with a maturity date of June 2025 at $98.85 on issue in June 2014 but you had to sell it a month later in July 2014. We know from the price in the chart -above that the price fell to $98 at that time. Think about what was going on here. Bond market yields had increased so someone could buy a bond issued by the Government of Canada with the same maturity date and get a higher yield of 2.4%. Even though you paid $98.85 for your bond, a buyer of your bond wouldn’t care what you paid, they would demand the same yield as everyone was getting. To increase the yield to maturity, a person buying your bond would offer you less than what you paid. A “discount” of $1 to $98.75 would mathematically raise the yield of your bond to the required 2.4%. An easy way to figure this out, not taking into account present value discounting, is that with 10 years to go, a $1 price discount works out to $.10 a year ($1/10 years) or .1% per year. Adding the .1% annualized price appreciation to the coupon of 2.25% gives a 2.35% “yield to maturity”. Government of Canada bonds all have the same “promise to pay” or creditworthiness so investors say they are “fungible”. This means they really don’t care which bond they hold, as long as the yield is the same and it’s a Canadian government credit risk. Don’t believe us? Have a look at the graph below. 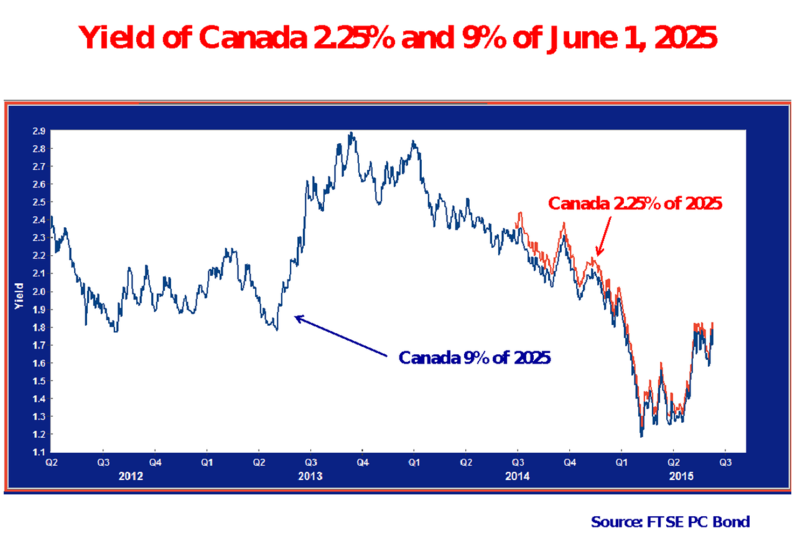 We show the yield of the 2.25% of June 2025 Canada bond below in red. The blue line is the yield of the Canada 9% of June 2025. 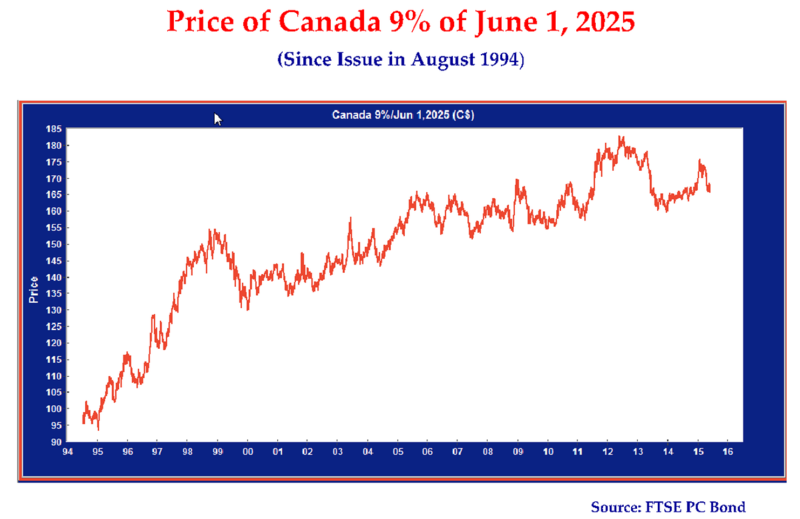 The 9% Canada of June 2025 was issued in June 1994 as a 31-year bond and now has 10 years to go until maturity. Notice how close the yields are on these two bonds even though there is a 7% difference in their coupon. The chart above is also interesting in that it shows the wide swings in bond yields during the 3 years since June 2012. Yields were declining during the Euro Debt Crisis in 2011 to 2012 and hit a low of 1.8% in June 2013. They then shot up to 2.9% in the “Taper Tantrum” of late 2013 when the Federal Reserve announced the gradual end of its bond buying “Quantitative Easing”. Of course, just when everyone thought yields were going up, they started to plunge in 2014 to make a new historical low of 1.2% in February 2015. At current yields, a 10-year bond moves about 7% in price for each 1% change in its yield. This means that an outstanding Canada bond would have moved up in price by 12% (1.7% x 7) from its 2.9% yield in late 2013 to its lowest yield of 1.2% in February of 2015. So we know from the graph above that the yield of the 9% of 2025 Canada bond is pretty well the same as our 2.25% of 2025 Canada bond with the same maturity date. How would we price the 9% bond to reflect the much higher coupon? Thinking about it as we did earlier, we would get an extra $6.75 per year (9%-2.25% = 6.75%) or a total of $67.50 over the next 10 years. Not taking into account the compounding and the “time value of money”, we should probably pay about $167.50 for this bond. As can be seen in the price chart above, the price of the 9% of 2025 Canada bond was actually $165.75 at the time of writing on June 5th, 2015. The slightly lower price than our “guesstimate” reflects the compounding of bond yields. We also show the price of this bond since its issue on August 8th, 1994 to show dramatically what happens to an outstanding bond with changing bond market yields. Note that this bond was first issued at $98.21 when 30-year bond yields were above 9%. Now, 20 years later, with much lower bond market yields, this bond peaked at $182.38 in July 2012. So you now understand that outstanding bonds change in price based on the prevailing interest rates and bond market yields. The real question is where do bond yields go from here. 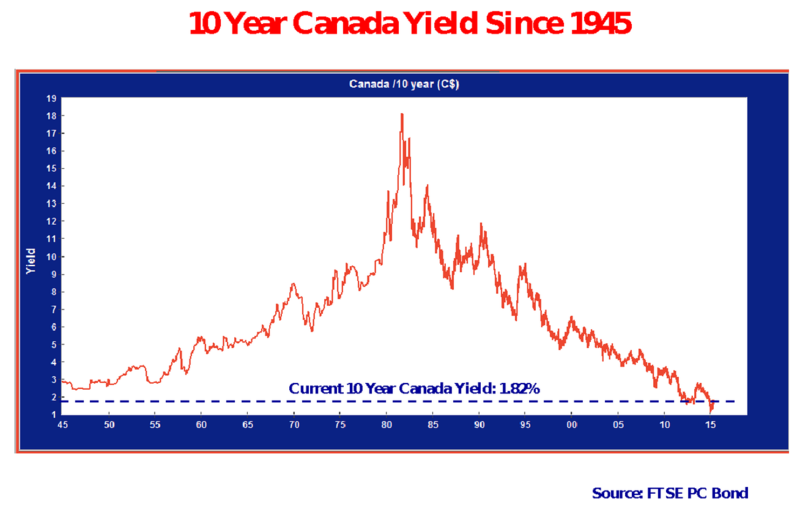 The chart below shows the yield on 10-year Canada bonds since 1945. Note that the current 1.8% is lower than at any time since 1945 so a reasonable person would think that yields have nowhere to go but up. There is another reason to worry about rising bond yields. Over long periods, Treasury Bills, the safest fixed income investment, tend to have yields about 2% above inflation. The Bank of Canada, Canada’s central bank, has been very successful in its mandate to keep inflation at an average of 2%. This suggests to us that T-Bills should be about 4% and a 10-year bond would have a 1% term premium putting the “normalized” yield at 5%. As we said before, a current 10-year bond would fall 7% for each 1% increase in yield. A move to 5% yields from the current 1.8% would mean a 21% decline in the price of all outstanding 10-year Canada bonds. Will this happen? Perhaps, but bond markets have a way of humbling people who make predictions on interest rates and yields. On the other hand, if you’re looking for a safe and secure investment, there’s a lot of risk in the bond market! The problem with rising yields is that once investors see the downside to bonds, we think there will be a lot of selling. Now that you understand the inverse relationship between bond prices and yields, you are now prepared and forewarned.